Cooking on my 18" kettle. Thread: Cooking on my 18" kettle. Surprisingly I'm finding the 18 to be more versatile than I thought. Direct cooking is great and today I did an indirect on it with a tri tip and it came out perfectly. I may be retiring my 22 for awhile. I use my 18"JJ more than the performer or the 22 platypus. Very efficient and plenty big enough for the two of us. I even cut the center out of an old 18" grate and got an under $3 SS Walmart dog bowl and made a vortex out of it. That works great also. I actually sold my 18 because I just wasn't using it. My Performer is just too dang convenient. I still have a JJ for mobile cooks. I agree Pat the performer is just about as easy as a gasser. When I designed the cart for my 18 WSM and JJ I had that in mind, so I built in an old side burner dedicated to lighting the coals for the JJ and WSM. Close to the performer in ease of operation. Last edited by Rich Dahl; 08-20-2018 at 01:30 PM. That is a very cool setup! I like how you repurposed one Weber grill to service an entirely different one. That arrangement puts the Jumbo Joe at a nice high height that I would certainly appreciate. 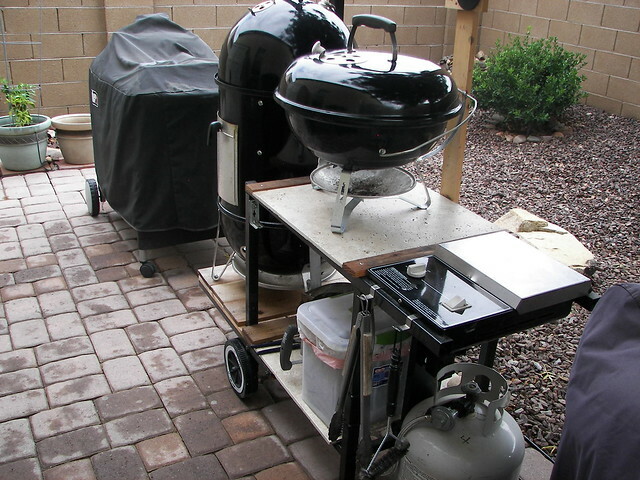 Jon, it also brings the WSM up about 8" and makes it movable and much easier to clean.